Every time my cat sees me, he puts his tail up. Why does he do that? Is he saying hello? Yes, he's saying hello! Putting our tails up is one way we let our humans and other cats know we're happy to see them. If you pay attention, your cat's tail can tell you all kinds of things about his mood. Here are some more things your cat's tail can tell you. When your cat's tail is up but curved at the end like a question mark, he's really interested in something. It can be a greeting, too, when the cat is a bit unsure. I do that a lot when I see other cats, because I can't decide if I want to hang out with them or just be by myself. Another way we say we're really interested in something is to hold our tails straight up with the top tipped to one side. Muffitt and I do that a lot when we see something moving through the grass. When a cat walks up to you with her tail curved over her back, she's saying she's happy to see you. Belle does that all the time, and our human thinks it's just so cute. Ugh... Belle can be so annoying. 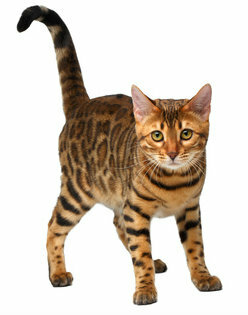 When you see a cat walking with her tail straight out behind her, she's feeling confident and relaxed. Have you ever noticed your cat sitting with his tail curved down but up near the tip? He sits that way when he's contented and relaxed. When we're frightened, we arch our tails and fluff them out as much as we can. That makes us look bigger than we really are and might scare off another cat or dog. When we're very frightened, we puff our tails out and hold them low. If you see the tip of your cat's tail twitching, he's annoyed and wants to be left alone. Violent twitching is a warning that he might attack. Here's another warning sign: Your cat's tail can tell you she's very angry when it's straight up and fully fluffed out. Be careful! She might attack if you come close. Dogs wag their tails when they're happy. We do not wag our tails! But we do swish them from side to side when we're about to attack something, although that something might not be you. When we're crouched down in the grass and are about to pounce on a bug or something a bit bigger, we usually swish our tails from side to side. I've seen cats do that when they play fight, too. I don't play fight. My fur could get messed up, and cat claws hurt! 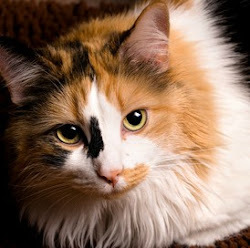 Not to confuse you, but some cats thrash their tails when they're getting up from a relaxed position. I'm not sure why they do that. Maybe they need a change of energy to get going. I understand that cats tuck their tails between their hind legs to admit defeat. I've never actually seen that, though. The cats I know are all really tough and smart like me and would talk their way out of a bad situation before getting into a fight. Soda's especially good at that and warns off all intruders, including dogs! Speaking of Soda, he just came inside with his tail straight up. I'm not sure if he's saying hello to us or telling our human it's time for dinner. Soda always thinks it's time for dinner! 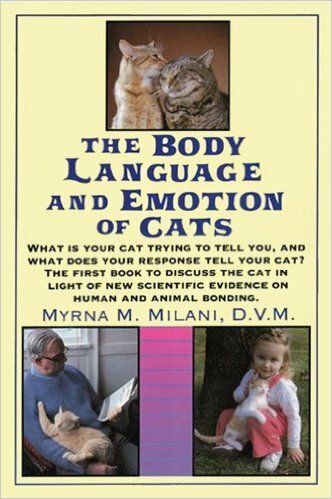 favorite cat behavior book .